Exhibition at Forres Library looking at old Forres High Street; Redressing Retail Case; Printing "Elephant" Tee Shirts; Printing and making up "Spice" Notelet Cards; Produing marketing material; Letters for children to use in Post Office Sorting Bench; Prepare and host workshops/presentations for school visits; Volunteers to act as guides for visitors/tourists; Produce interpretation for recently restored painting and organise talk from restorers; Ongoing oral history recordings; Digitise and collate slide collection; Produce podcasts for use on internet; Research names given to closes in Forres e.g. 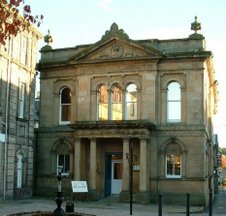 “Singer’s Close”; Research history of local Italian Families and a computer training day at Forres Library. There were 13 volunteers there and they were all enthusiastic about the ideas. The really good news was that we are now based in the museum laboratory and store so this gives us a lot more room and scope to do more than one project at a time. Yesterday was the first session in the lab and we had people printing and drymounting labels, writing envelopes for the sorting bench and printing folding and packaging the spice notelets. Rebecca Bolton, Community Librarian, came and explained the Forres High Street Exhibition they will be exhbiting at the libray and how we could help. This went down very well and some of us are going in on Friday to start work on our bits and pieces. It was a very successful day made more so by a surprise visit from Alistair Campbell, Libraries and Museums Manager who was delighted to see how successful the volunteer sessions are becoming. Last year's hard work by the volunteers has paid off and we have gained our independence and a closer and mutually respectful working relationship with the museum staff. Sounds like you are busy busy bees without me. Congratulations and good luck on the short list of projects to be done by the end of February! !